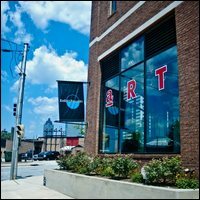 As Castleberry Hill's premier fine art gallery and event space, ZuCot Gallery showcases the best contemporary art from around the world in a striking, design-orientated space. The gallery's international collection of original work includes pieces by artists from a multitude of cultures and artistic disciplines. Parking: ZuCot Gallery has a covered garage parking on the premises. Free street parking is also available surrounding the building on Centennial Olympic Park Dr. and Nelson Street. MARTA: The gallery is a short walk from the Dome-GWCC-Philips Arena-CNN Station on Centennial Olympic Park Dr.